We were searching for vegetarian or vegan food for “Vegan January”, while wishing it was February, when we came across the latest restaurant in Brixton. 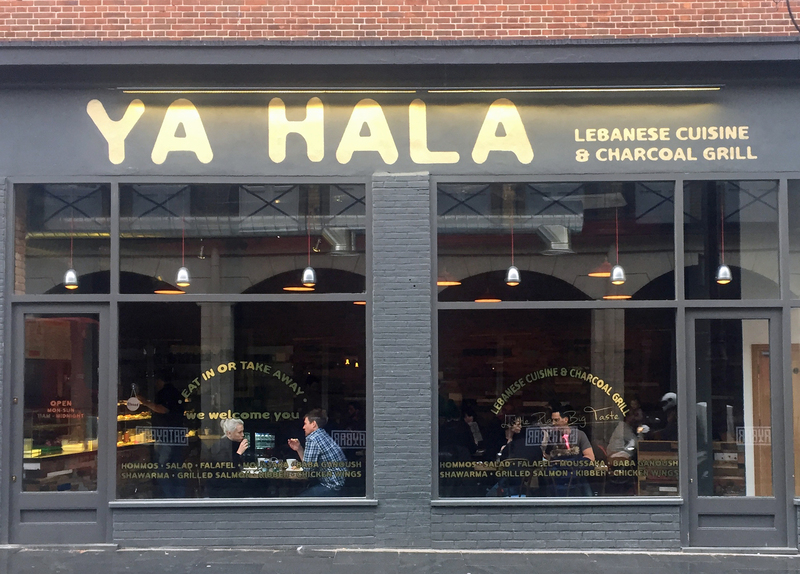 And hurrah, it isn’t a burger joint but fills a gap in Brixton, a decent Lebanese restaurant with a charcoal grill. Our first visit was positive and as it’s right opposite the Ritzy in Coldharbour Lane, it should prove useful for a before or after meal, particularly when you are short of time. Brixt on Village is the new food haven that was once a small market called Granville Arcade in the middle of Brixton. Gradually this market lost many of the shops and since the middle of last year it began growing with more and more pop-up restaurants. It is now a vibrant part of the local area attracting visitors on the way to the Ritzy or just out for the evening. We decided to produce this introductory entry in order to help people plan a visit – although it is a place you can just wander into as it has something for everyone. The restaurants are a mixture of brand new and well established – mainly the South American ones. The new kids on the block are an eclectic mix of Japanese, Thai, Chinese, Italian, French, Caribbean, Pakistan, Middle Eastern, American, and British and we have already reviewed the majority in this blog. They are not only eclectic in their origin but also within their menus with most stretching across the country barriers. They also specialise – so Italian food comes as pizzas (Agile Rabbit), pasta (Belantonis, Casa Sibilla) and ice cream (Lab G). They are all sizes too with some squeezing into impossibly small places where virtually everyone is eating outside and others which are more established stretching across the alleyways to other rooms to provide more inside eating space. The Village grew exponentially last year during the late summer and early autumn when it was pleasant to sit out in the middle of the arcade but even with the cold days and nights is still attracting hungry visitors. Some restaurants now offer the odd heater and a blanket or too for those hardy enough or hungry enough to sit outside but the savvy diners now know that they need to book to get a table inside. Brixton Village is not just restaurants there are cafes (WAG – wheat and gluten free), coffee shops (Federation Coffee) and tea shops as well as places that sell sweets, secondhand clothes (OK Vintage…) as well as delicatessens. There are also the remains of the original food stalls selling fish and meat. There are interesting greengrocers with displays of Caribbean fresh foods and African dried fish which I have rarely dared to buy and when I have were total disasters. There are also one or two stalls selling those household goods that we used to buy in Woolworths when it was in the High Street. These really add the colour with their displays of plastic bowls and flowers. 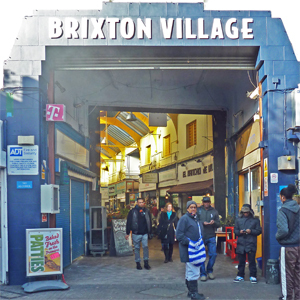 Brixton Village is still evolving and by the warmer months is likely to be much busier and may then be self-sustaining. This will depend on the rents which are going up for those who remain open in the evening. Below we have tried to give some seasonal information to provide readers with an idea of what to expect now that the village is so popular. We welcome any comments that can help smooth people’s visit to this vibrant culinary destination. We have tried to make this blog informative but it is very difficult to keep up with two aspects of the restaurants in Brixton Village – opening times and licenses to sell alcohol. Alcohol – About half the restaurants have a license and those that don’t are happy to provide glasses. If you arrive without any alcohol then your two best bets are (i) go to Sainsbury’s local near the tube station for wine or (ii) go to one the off licenses on Coldharbour Lane for beer – either should only take ten minutes. Alternatively they all sell interesting mixed juices and soft drinks – although some of the ginger beers are anything but soft. Opening times – As a general rule most restaurants are open during the evening later in the week – Thursday onwards. Nearly all are open for lunch from Wednesday to Sunday and a few open during the day on Monday and Tuesday but rarely in the evening. The websites are not that informative as things are moving swiftly so if you are making a long journey just to come here rather than any of the other great restaurants in Brixton then telephone beforehand. Getting a seat – if you want to take pot luck and haven’t booked then choosing when to go is essential unless you are prepared to wait. There is a rush between 7.00pm and 8.15pm. We assume this is for those heading to the Ritzy. If you time your arrival before or after these times you will usually be in luck and get a seat really quickly. Don’t be put off by long queues such as at Honest Burger as they do turnover pretty quickly and most of the waiters will give you a pretty good idea of how long you will need to wait and often provide some seating. But if you are keen to try those restaurants that always seem to have a queue then just go for lunch at the time they open. If you want to try the best burger in London – and everyone should – then visit Honest Burger shortly after it opens (12.20) on Monday and it will be empty for at least 20 minutes after that. As a last resort some fo the restaurants also do takeaways of sandwiches and substantial wraps that you can take while you wander round. What to wear – this is not the beginning of a fashion guide as this place is laid back and casual. But we want to remind people that it is cold outside and Brixton Village is like the outside despite the fact that it is under cover. The wind sweeps up the long corridors and most people keep their coats on when outside and if you intend to eat more comfortably then layers are essential.